There has never been a need for me to switch Rufus’ dog food. He’s never had a sensitive stomach and always eaten his food with no issues. That was until a Sunday evening when I spent my time procrastinating and looking up the nutritional value in dog food. I researched Rufus’ dog food and found on All About Dog Food that our well known brand of dog food scored a measly 1 out of 5. Honestly, I was in shock. I felt like a bad dog owner because my poor pup hadn’t been getting the very best. Once reading the results, I started doing my research to find an affordable, healthy dog food alternative. 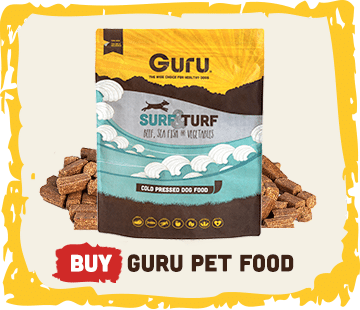 From the number of dog bloggers I follow, I’d seen nearly almost all of them rave about Guru Pet Food. 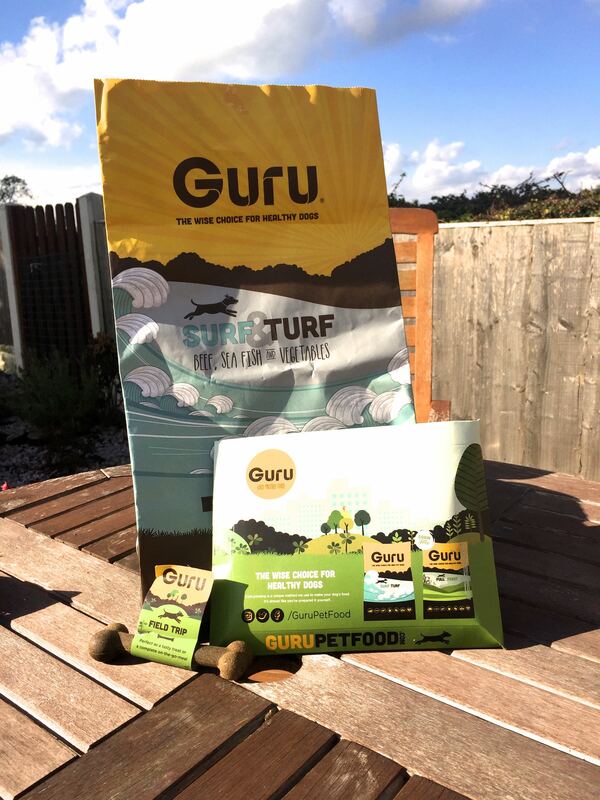 We arrived home on Tuesday to a huge parcel of Guru goodies for him to try! 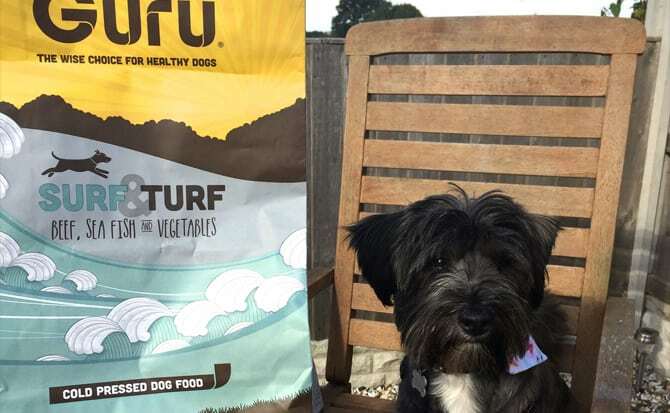 Guru kindly sent us a sample of their ‘Surf and Turf’ dog food – containing beef, sea fish and vegetables and their grain-free ‘Full on Feast’ dog food – containing duck, sea fish and vegetables. They even threw in a super handy measuring cup and two small field trip bones. Safe to say, I had one excited puppy and I’d be lying if I wasn’t a teeny tiny bit excited too. Why was I excited? I mean, it’s dog food when you think of it. I was excited because I was part of something that not many other dog owners know about. 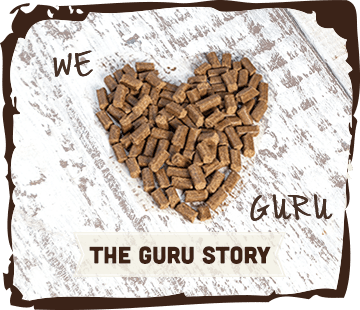 The thing that makes Guru different from other dog foods is because they cold-press their food. Instead of boiling all the ingredients at high temperatures, Guru grind the ingredients and gently mix them, before they are pressed at really low temperatures for a few seconds. It means the food keeps the majority of it’s nutrients and it’s about as fresh as you can get for a dry food! The real test is what Rufus thought of it and if it was a change worth making. I won’t lie – I was worried about feeding him a lot less food. Typical terrier (and like me), he’s always thinking about his belly. Guru have a handy food measuring guide on their website and with Rufus weighing 10kg, I was only going to be feeding him 100g of food. However, the pellets are super chunky and because they break down quicker than normal dry food, they satisfy your dog quicker. For the first few days, I mixed Guru with his kibble and every meal went down the hatch straight away. He loved it. For the past 2 weeks, we’ve been slowly transitioning to Guru and now Rufus is on 100% pure Guru. He now eats every single meal without fail, enjoys that he can either have it either warm or cold which mixes it up a bit and it’s peace of mind for me knowing I can give him the best I possibly can! For us, it’s the best choice we’ve made for Rufus and ourselves. He’s getting a great balanced diet, we’re feeding him the correct amount we should be and it’s more cost effective for us. 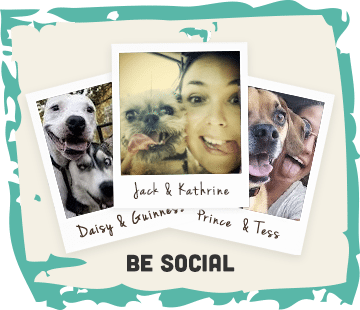 The team at Guru Pet Food on social media are extremely friendly too so I know I can drop them a message at anytime! If you’re looking to make a change to your pooches food, I cannot recommend them enough!